Your kids are going to visit your ex regularly and if the level of safety consciousness is not quite the same as yours, this is for you. Instead of getting furious and having another unresolved argument because the other party simply doesn’t get it, why don’t you rather teach your kids some basic emergency tips and first aid that can help save a life? It is a valuable skill to have and would definitely put your mind at ease knowing your little angels can take care of themselves to a degree. Remember to teach this serious stuff in a fun way so that you will not scare them or make them apprehensive about being away from you. Keep it matter of fact and encourage them to learn these important things in order to be independent. Help them to memorise basic details about themselves as soon as possible, such as their full name, age and home address (including your ex’s address). They could also learn the name(s) of the medication they are taking and any allergies they might have. Teach them your full name and telephone number so that they can repeat it to another person or dial your number if necessary. Teach your children self-care skills as soon as it becomes age appropriate. Ensure that they understand the importance of applying sunscreen when they’re outdoors and to ask for help to apply it if they cannot yet do it themselves. Impress on them the importance of wearing a hat outdoors and instill it as a healthy habit. Until a child is capable of safe self-medication which is probably only in the teenage years, teach them the names, dosages (eg; number of spoonfuls) and times they need to take regular/chronic medication and encourage them to remind the other parent to administer it. However, be absolutely clear about the fact that they are not allowed to take any medicine by themselves without adult supervision. As soon as kids can recognise numbers, you can teach them some valuable emergency numbers such as the Police, Emergency Services, Ambulance, Fire Brigade etc. Teach a child what to say when calling. Give their full names, the reason for the call (what is the emergency) and the physical address (where they are). Apartment or street numbers are important. 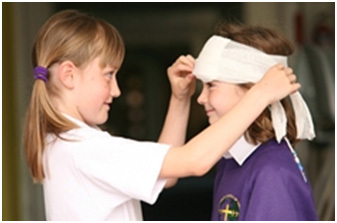 You can role-play some emergencies to practice and give them confidence. Remind them where the first aid kit is kept at both homes, so that they’ll know where to find it, even when they are in shock or panicking. Show them the contents of the kit, teach them the proper names of the items and demonstrate how to use each one. This presents another opportunity for some exciting role-play. Teach your children how to apply direct pressure to any wound by covering it with gauze, paper towel, clean cloth or clothing until the bleeding stops or help arrives. If possible, they should protect themselves first, by wearing gloves or covering their hands with plastic bags. If something stuck into them, such as a stick or broken glass, teach them not to pull it out, but stop the bleeding and call for help. Bleeding can be stopped by pressing around the wound while supporting the object in place. It would also help to elevate that part and keep it still. Explain to them that broken or cracked bones are called fractures. They should keep the injured part still and call an adult for help. Make the person comfortable but do not let them eat or drink anything, in case they have to have an operation to fix the fracture. Never leave a child with a broken bone alone. Rather stay and keep them calm. Teach your children what to do when their clothing catches fire: Stop, Drop and Roll. Have them practice it by stopping right where they are, dropping to the ground and covering their faces, while rolling over and over and back and forth until the flames are out. Then they should cool the burn with running cold water and get help from an adult. This knowledge will boost childrens’ confidence and help them to save themselves or even someone else one day. At the same time it will serve as an invaluable safety measure for visitations.